I've been sorting through my office "junk" drawer the last few days trying to make some sense of it. It's become the home to various items including expired coupons, broken tape dispensers, random key chains, and a huge stack of free return address labels that I've received through the mail over the past several years. It was a pretty easy decision to toss the expired coupons and broken tape dispenser, but I'll admit, the random key chains and the free return labels sat in the "not sure" pile for longer than they should have. By the way, does anyone need a Red Cross key chain? As far as the return address labels, I created a new pile for them called "find alternative use." I'm not sure if I was just trying to put off cleaning (hint: I was.) or if I was channeling my inner Martha Stewart. Regardless, it worked in my favor, and I hope it works in yours to! 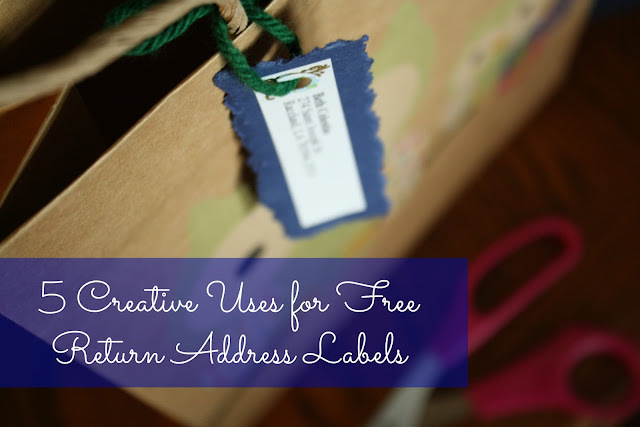 So if you find yourself with piles of free return address labels and can't bring yourself to toss them, you may like these alternative uses. Tape the label to a piece of colored card stock paper and trim around it (use paper edging scissors to give it a more polished look). On the blank side, write, "To: __________". Hole punch the corner of the label and tie it around the handle of a gift bag with a piece of yarn, twine, ribbon, etc. Not only will the recipient know who the gift is from, but they will also have the address handy for sending out a thank you card! Whether you're bringing your favorite casserole to a potluck or delivering a meal to a new mom, you probably want your dishes and utensils back, right? Keep a sheet of these labels in your kitchen "junk" drawer (yeah, I have one of those to.) and pull them out to label your stuff before sending it on it's way. This is also a great way to label other items that you lend out frequently like books or DVD's. I've you're attached to your favorite office/craft supplies like I am, you may find yourself toting them around with you at times. Being highly involved in the children's ministry at my church, I tote my supplies with me more often than not. It's easy for these types of things to get lost in the shuffle. Labeling them is a great way to keep track of them. I cut the address off the label and just use my name. It's the perfect tiny label for supplies that don't have lots of labeling room on them. One pretty unconventional way I'm going to use my labels is on our church tithes and offerings envelopes. I'm going to pre-address a few to save myself some time on Sunday mornings. (Lest you think I'm being a drama queen, read this post about our Sunday Morning Scramble and have some mercy.) This would also work for other random forms you frequently fill out that require a name and address. I would dare say that umbrellas are probably the most frequently lost items on the planet! Seriously, I've collected several over the years that I'd love to send back to their rightful owners if only I knew who they belonged to. And I've also misplaced several of my own. I guess they're like money, they just change hands a lot, right? The problem is, I like my umbrellas as much as I like my office supplies so I'd like to keep them around for more than one rainy day. A little label on the inside (because putting it on the outside would just be silly) would give me (and you) a better chance of keeping dry on the next stormy day! I'd love to hear your ideas for using these free address labels! Shared at The Shabby Nest's Frugal Friday.